Our son is hard at work training to become the 2022 National Spelling Bee Champion. (He doesn’t know that yet.) 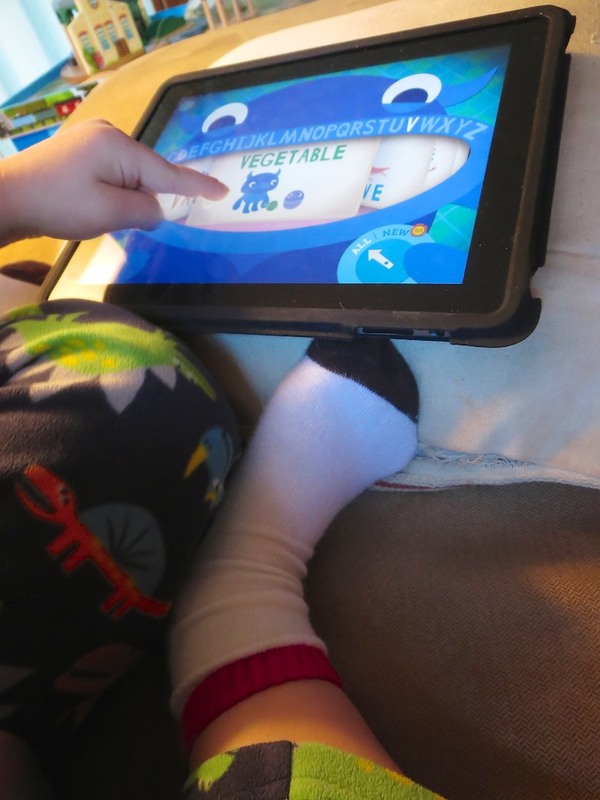 But I figured at least 2014 would be a great year to turn our iPad into more of an educational machine for his noggin. Our little boy will soon be turning four! And as his birthday approaches, I figure it’s a good time to review how he’s ‘using’ our iPad. Way back when he was only two, he effortlessly learned the touch screen user interface on my old iPhone. Finger swiping was as intuitive for him as drinking out of his favorite blue sippy cup. We loaded up a few age-appropriate game apps and let him explore his newly digital terrain. The challenge, of course, was setting limits as to how long he could play with the magic screen. The longer he spent with my iPhone, the more ‘engaged’ he became. So eventually, the iPhone was banished to ‘the repair shop,’ and we refocused our boy towards more analog-based learning toys. A year later, we brought out our iPad and experimented with the Disney app to stream some age-appropriate cartoons. But we soon ran into the same ‘disagreements’ surrounding how many shows he should consume in one sitting. And so the iPad had to take its own extended trip to the virtual repair shop. A few months ago, it reemerged as a weekend-only device and only available as a privilege if the previous day had not seen any unsupported behaviors. The year of the terrible threes really did have some ‘special’ moments. I would say we’ve finally developed a reasonable balance of limited multimedia time in our son’s life. But he’s going to be four soon. I know there’s so much more to the iPad for preschoolers than streaming Disney Junior! It’s time to dial up the learning quotient! The other day, a friend of ours pointed us to three math and vocabulary/spelling apps she really likes for her five-year-old son. I think she even included the word, ‘phenomenal’ in her email to us. These apps are a little pricey, costing a few bucks each, but a recommendation from a friend who’s also a teacher goes a long way towards making this kind of decision. He played with this adding/subtracting game for about fifteen minutes and was fully engaged. But it was relatively difficult for him… my boy adds by counting actual objects. So it’s really just above his learning level. But I expect it will gain more traction through the year ahead. ‘1st Operations’ also offers multiplying and division… should your little Einstein be ready for all that. This one was the clear winner. He really loved this spelling and vocabulary game. It allows him to match letters and listen to their sounds as part of a word while he builds words and listens to their definitions. This one is the coolest-looking of the bunch. For you deal seekers out there, there’s also a free version you can download that contains the usual in-app purchase options for additional content. I chose to spare my son from all the marketing static and went for the full boat upfront. ‘1st Generations’ was a much better fit, and that one was still a stretch for him. On the up side, the graphics were really engaging. I’d like to give a special shout out to our friend who pointed me to these three apps. Though they weren’t all exact fits in the Lester Learning Lab, I’m happy we’re exploring more educationally focused apps for our son. Our friend also asked if we had any recommendations of our own. In an attempt to harness the wondrous power of crowdsourcing, I thought I’d put the question out there to the greater parental consciousness.